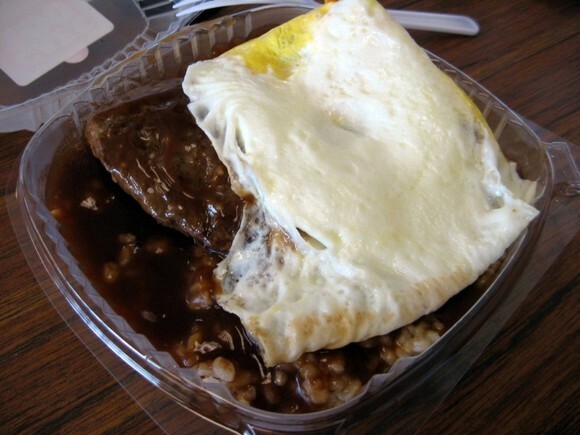 Loco moco, a thoroughly Hawaiian delicacy comprised of white rice topped with a hamburger patty, a fried egg, and brown gravy, was invented in 1949 in the city of Hilo on The Big Island. 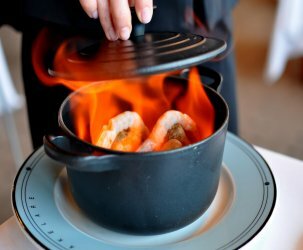 There are many people who claim to have invented the dish, but it is generally agreed that Cafe 100 or the Lincoln Grill created the first one. I felt sick to my stomach after my first brush with loco moco back in April, so it took nearly a week on the islands for me to get up the guts to give it a second go. 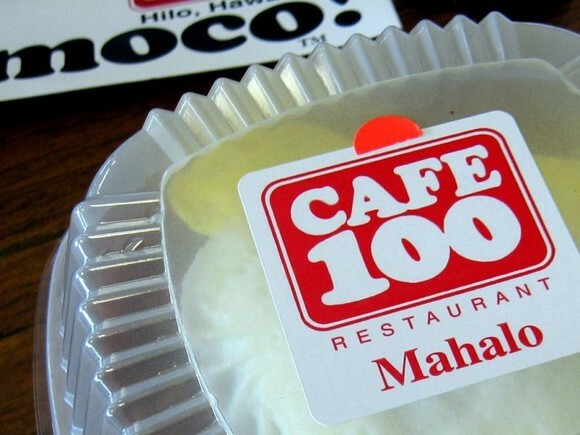 When I found myself in Hilo after an excursion to the Hawai’i Volcanoes National Park, I toughened up and paid Cafe 100 a visit. 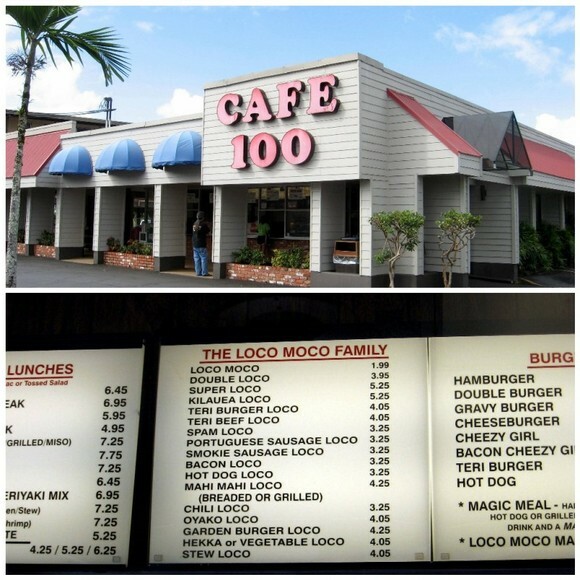 Cafe 100, which owns the trademark for the term “loco moco,” dishes up over fifteen varieties, including ones made with “smokie” sausage and mahi mahi. Adorable hand-drawn posters that reminded me of projects from junior high advertised the most popular renditions. 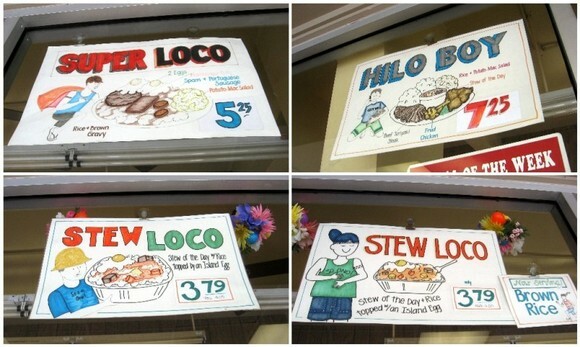 All of the loco mocos were priced between $1.99 and $5.25. I went with the OG loco moco for a buck ninety-nine—brown rice, fried egg, hamburger patty, and gravy. The weighty loco moco was packaged to-go in a plastic container. Both the plump grains of brown rice and the rubbery hamburger patty were swimming in a sea of gelatinous brown gravy. The gravy’s taste wasn’t offensive, just not nearly delicious enough to be drenched over everything. Come to think of it, I’m not sure there’s any sauce in this world that would taste pleasant ladled on in this excessive manner. Although I’d love to say that loco moco on the motherland was ono to the max, it really wasn’t. It’s the end of the road for loco moco and me. It’s been real, brah. I love the word loco moco. it rhymes. but yeah, it looks pretty nasty. also, isn’t it the reason why hawaiians are obese? the loco moco needs a makeover like maybe Subway can do a version and they can hire Jared to discuss the healthy gravy-less egg white, turkey patty version. that doesn’t look appetizing at all… looks like a serious gutbomb! I’ve been on a bit of a search to find a good locomoco up here in the bay area too… awww you must keep the faith! I think you and I may be compatible on this one. Just the thought of loco moco makes my skin crawl. And gelatanious gravy is never a good thing. Katrina & Foodhoe – Let’s say a delicious loco moco does in fact exist. I would argue that it isn’t really an authentic one because the people who invented the dish would not recognize it as so. Get what I’m sayin? This is why I read these posts…now I don’t have to waste a few good meals looking for a great loco moco when it probably doesn’t exist. In theory, it sound so good! It’s too bad. Umm, that was a $1.99 version. I wouldn’t expect much for that price. If you aren’t a fan of gravy, hamburger patty’s and white rice, you will never like a loco moco. 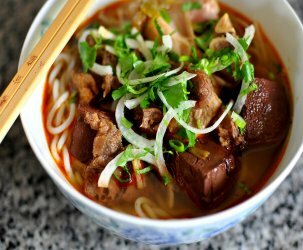 It’s comfort food at best. I think you need to give it another shot. Let’s get around to doing a loco moco crawl with Kat! I saw loco moco all over Oahu. But, one look at the gravy soaked patty was enough to discourage a taste test… I’ll pass brah. The first place I had loco moco was at the now-long-gone Lincoln Grill, if that’s the “hole-in-the-wall” place that was mauka of the now farmer’s market. It was delicious and I always went back till out of high school and moved. That old man and his wife made really good comfort food. Good old style homemade burgers. I was very disappointed to try Cafe 100’s loco moco. More like rubbery frozen patties. Oh, brah… what you thinkin?! 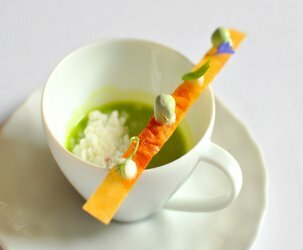 I used to live within 300 yards of Cafe 100! I LIVED on loco moco while I was in college ([email protected]!). I am from hawaii, I too think li hing is like crack!!! !